Stephen Dorff and Elle Fanning share some nice moments in Sofia Coppola's SOMEWHERE. 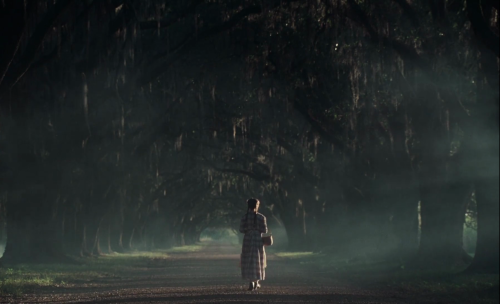 Somewhere out there a great film awaits Sofia Coppola. In some parallel universe she’s directing a masterpiece. But not here. Not yet. 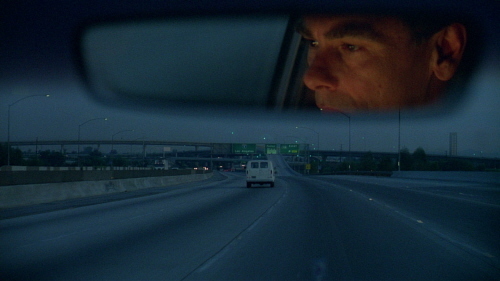 Somewhere is a film that just is what it is…which is a film about nothing. Even in interviews, the oft-maligned auteur admits in no uncertain terms that the film is really about nothing. It’s just about the mood…the moment. And like all of Sofia Coppola’s films, it grows on you as it languidly progresses. You get used to the cadence and the ennui, the repetitive imagery, the sometimes uncomfortably sustained shots (oh, imagine what she could do with neo-noir or psychological horror) that ultimately signify the vapid nature of isolating stardom and luxury. And when the bored movie star (Stephen Dorff, scruffy but agreeable) is temporarily interrupted from his nothingness by his bright and mostly cheery young daughter (Elle Fanning), you get a muted fuzzy feeling, melancholy somewhat, and little bits of humor, embarrassment and do-nothingness fun contribute to a glazed, dreamy atmosphere where you like what you see, you get the feeling, and the mood is alright, baby. But there’s nothing there. Every year there’s that one film that is unfairly maligned by critics either for its troubling subject matter (like 2004’s underrated Nicole Kidman reincarnation melodrama Birth) or for its unique style that turns off a lot of people…like the film reviewed below. Sofia Coppola is quickly becoming an auteur you either love or hate. Her Marie Antoinette (adapted from the book by Antonia Frazer) was recently released on DVD after an undeservedly brief run in theaters this past October. From its beguiling star Kirsten Dunst to the maddeningly beautiful locales to the visual sumptuousness and “taste” (you almost feel as if you could eat some of the scenery and clothes) of the costumes and art design, Sofia Coppola’s “Marie Antoinette” is an entrancing and lavish period piece of the highest order. 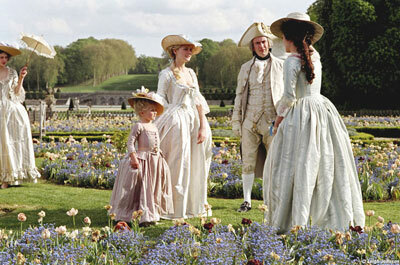 Many of the early scenes of the Austrian and French woodlands and the palatial splendor of Versailles are cloaked in an almost “otherworldly” austerity, evoking the spirit of Stanley Kubrick’s ultimate costume-drama, “Barry Lyndon.” Later, when our heroine finds some inner piece at the countryside estate she is given as a gift after the birth of her first child, Coppola immerses the viewer in the transcendent splendor of natural sounds and beautiful images that channels the fluid mise-en-scene composition of the best work of Terrence Malick. All of this is tied together by Coppola’s now signature dreamily listless camera play that makes her unlike any other director working today. In the lead role, Kristen Dunst is mesmerizing. She’s always been a better actress than she’s been given credit for. She’s only previously been allowed to really stretch her acting muscle when she took on the role of Marion Davies in the excellent “Cat’s Meow” and as the emotionally unstable teen in the misguided “Crazy/Beautiful.” Here, without much dialouge, and present in just about every scene, she speaks volumes with her eyes and body language. Coppola only briefly channeled into Dunst’s innate talents in “The Virgin Suicides” and wonderfully fulfills the promise of a fruitful director/actor collaboration that those with a keen eye could divine from their first experiment together. Of course, those who measure a biopic by its historical accuracies will cry blasphemy at some of the treatment here, most notably the use of new-wave pop music in equal measure with a classical score. Also, the drama of the French Revolution is glossed over spare for the final ten minutes, almost as it it were a side-note in history. The vapidness and decadence of the French Court is Coppola’s focus, as is the alienation of a people from their government, family members from each other, and most importantly a young woman from herself. Though this classic theme of alienation (which permeates many of the great films from Coppola’s father’s contemporaries) seems to be treated here with a softer touch that on the surface paints it as a trifle…the haunting closing scenes of Dunst leaving Versailles behind forever are not without their emotional resonance. If Coppola delivers us a big hit with her next project, or not too far thereafter…then I suspect in about ten or fifteen years, “Marie Antoinette” will be looked upon far more fondly than it has been thus far. Rightfully its costume design took home an Oscar. If the movie gods smile down upon us, Coppola will have a long fruitful career, and this film will surely be more than just a foot note of her early days.